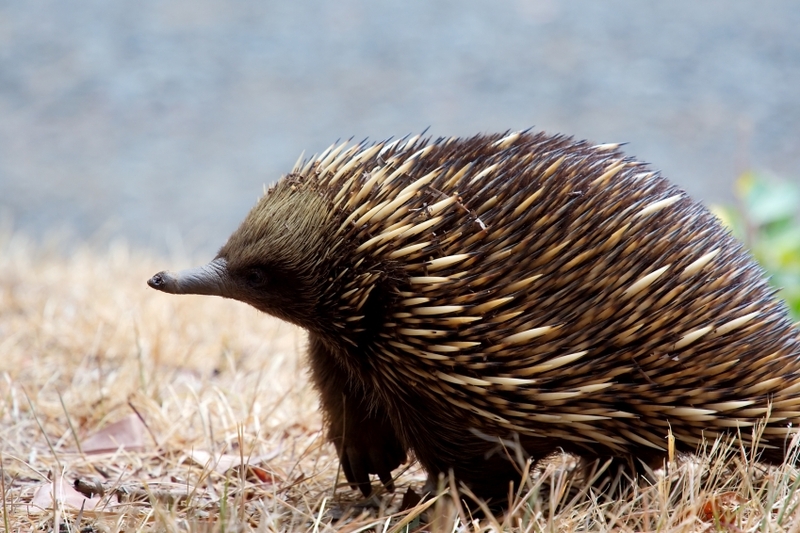 Echidnas lay a single egg in a pouch on the female’s belly. The egg has a leathery shell. The egg hatches in 10 days and the baby echidna is born blind and hairless. It gets milk from a gland within the mother’s pouch. In a few weeks, the baby (called a puggle) develops sharp spines, and must leave the pouch. The echidna has long spines protecting its body, long, sharp claws on the feet, and a very sensitive snout. There are two types of Echidnas, long-nosed and short-nosed. Echidnas are 14-39 inches (36-99 cm) long with a 4-inch (10 cm) long tail.